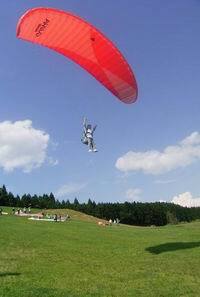 I want to fly in the sky! I want fly hightech & safe equipment! 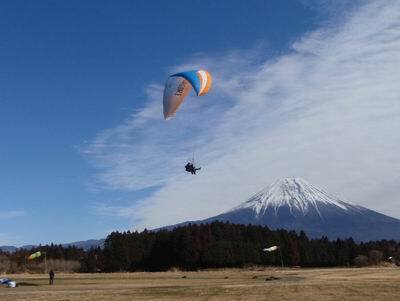 I want to fly while watching Mount Fuji! ! (\6,000 Until March 31st,2018) You can easily experience floating freely in front of mt. Fuji. (\8,000 Until March 31st,2018) A qualified instructor tandem pilot will take you for a walk on air. 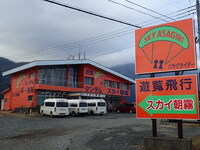 You sit back and enjoy the view of Asagiri Plateau from an altitude of 300m. If this is your case, then our accessible “Challenge Course” is made for you. 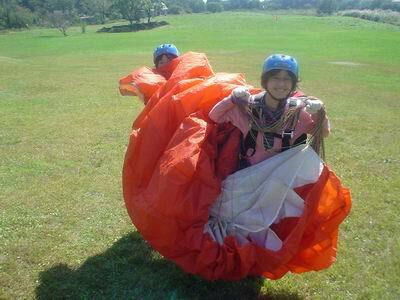 Enjoy floating on air, with the support of our qualified staff. ※ If you enroll to our school after the “Experience Course”, you will be granted a licensing discount. 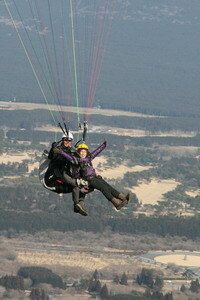 Enjoy exploring the sky with our paragliding instructors This is what “Tandem Course” is about. 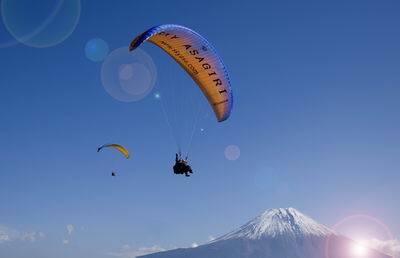 Leave the paraglider control to our instructor, and fully enjoy flying from a high place, with the wonderful view of the unique Asagiri Plateau in front of you. Our shop is along National highway No.139. familyMart(a convenience store) is on the other side of the road from our shop. You can see our big green signboard. At first fill out the registration form. Next,you go to the landing zone parking area by car. If somebody is already flying,you can see how to land. We take you to the launch by car. This launch is 300m higher than parking. 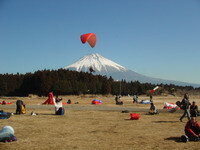 When you get out of the car ,we are sure that you will be impressed by the beautiful landscape of Mt Fuji. We put you in the harness(chair like)and put on you helmet. Finally!The time to take off. The time waiting for good wind is most sensitive time for you. You have to run until you are in the air. Your feet leave the ground and you are flying! 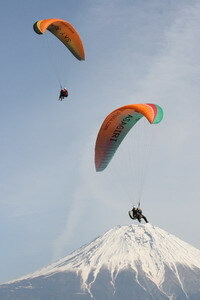 Enjoy the sky in front of Mt.Fuji! 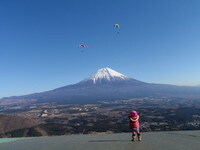 Try to take photos of Mt.Fuji by changing the angle of the camera. When we line up,take a photo of each other. Usually we fly for about 10min. When we land you have to run again a bit. Our landing place is a great big lawn. If you land first,take photos of your friend's landing. At last we give an experience certificate to you. 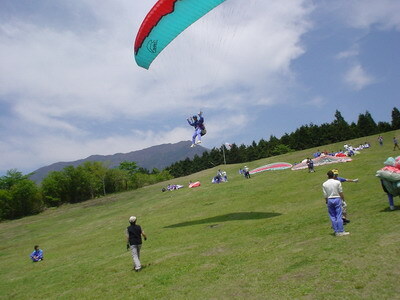 ※ If you enroll to our school after the “Tandem Course”, you will be granted a licensing discount. Closed on Thursdays Opened during public holidays. For those who wants to experience the control of the paraglider, and a flight from a high place, here is our “Set course”, which includes both our “challenge course” and “tandem course”. ※ If you enroll to our school after the “Set Course”, you will be granted a licensing discount. Closed on Thursdays Opened during public holidays. ※Experience of previous course,school enrollment, and you are asked to have discounted licensing course. Equipment　：　Gloves (gloves available), long sleeves and long pants, Sports shoes (high-cut ones if possible), towel and change of clothes. ※※Phone by 18:00 the day before,please email your reservation two days before. ※※The above rates,rental equipment,rental facilities,include the consumption tax. 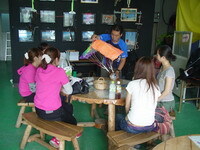 ※※Cancellation fee for each course. If you want to cancel, please contact us as soon as possible. ※※For the group, pursuant to trip cancellation fees will apply. 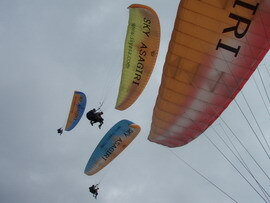 ※※The course (experience, Tandem, packages) facility fees include insurance for flyers.